G is for grace, grit, gastronomy, gluttony, and girth. Set in the Holiday Inn Express and Suites on Wingo Way in Mt. Pleasant, Grace & Grit provides a beautiful, airy space with a menu that promises to bring all these “G” words into your life, at least potentially. 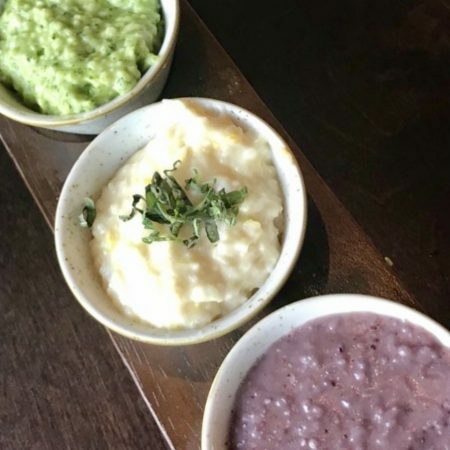 At its core, the restaurant is predicated on a gimmick, but it’s a contrivance that works, with grits rendered in enough colors and flavors to bring to mind a gelato shop. A veritable Baskin Robbins of coarse ground corn, there are nine or 10 rich, savory options — not to mention a handful of sweet, creamy selections — on offer. But regardless of the nuances, make no mistake: This is some next-level decadence. The grit flight ($10) sets the stage, while simultaneously alpha-dogging your ticker. The first — a bright green, butter-heavy Brussels pesto grits — presents traditional basil and parmesan notes backed by the earthy sprout flavor. Reminiscent of risotto, it’s decadent as all hell. Similarly, the pimento cheese variation is chockablock with roasted bell pepper and cheddar notes. It tastes like what it is, grits loaded with cheese dip. In contrast, the coconut cream grits — a dessert-style variation — are lightly flavored, but heavy with sweet creaminess. The dark purple blueberry grits were an unexpected pleasure, kind of like eating a warm velvety bowl of cobbler. No fat has been spared in the preparation of this food, but you only live once. 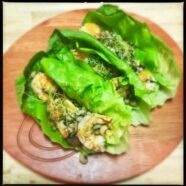 If you’d prefer to survive a little bit longer, the pickled shrimp and Sweetbay bibb wraps ($8.50) are a solid choice. Here the typically Asian offering has a distinctly local flair, with three lettuce leaves filled with a salad of tender black eyed peas and pinto beans, which is then topped with three halved shrimp and a bright, lemony dressing. The only thing interrupting the mostly genteel Southern sensibilities is the potent finish of robust cilantro microgreens. But where the shrimp wraps are fresh and light, the North Carolina crab and corn fritters ($13) are dense and doughy. The two, golf-ball sized fritters are panko-coated and deep fried. Moreover, corn is not really in season and doesn’t add much. Considering the product and price point, I’d rather see the delicate crab meat showcased in a more elegant preparation. The accompanying pickled collard slaw can stay though. 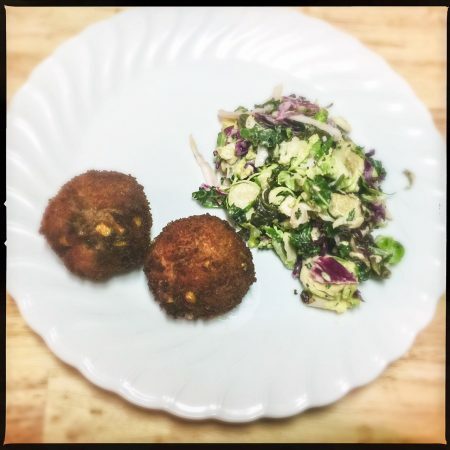 Made with (presumably) leftover collards, thinly sliced Brussels sprouts, and red cabbage in a light poppyseed dressing, it’s sweet and vinegary with a good toothy crunch. Similarly, the tarragon remoulade and pungent lemon jam are both superb and deserving of a more worthy companion. Staff is outfitted in blue plaid shirts and denim jeans, and the down home look extends to the service. Warm and friendly, servers are attentive but not too much so. The space itself is filled with windows and is wide open and elegant, yet still cozy. Not a bad spot to while away a couple hours. The sweet tea-brined pork chop ($24) is served on the bone. 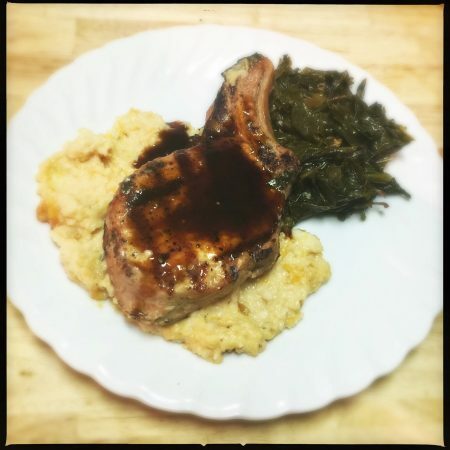 Moist and tender with a great char flavor, the accompanying peaches and cream grits are bland and indiscernible, minus the pronounced elements of “rich” and “sweet.” The generous portion of sweet tea reduction on top has notes of molasses and renders everything a little too sugary. I would have preferred a more savory grit, or maybe something like a caramelized onion sauce instead of the sugary reduction, to calibrate. The accompanying collard greens are well-balanced with bacon and vinegar. Perfectly tender and boldly seasoned, they help to counter the treacliness of the rest of the dish. Meanwhile, the pan roasted grouper ($34) delivers a generous, eight-ounce chunk of fish. 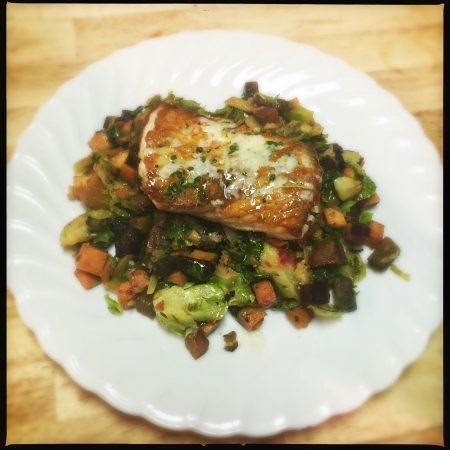 Beautifully seared with a rich golden crust, yet still tender inside, it’s served atop a seasonal hash of Brussels sprouts, cubed sweet potatoes, and red and yellow beets. Also made with house bacon and fresh herbs, the zesty citrus butter melted over the flaky fish brightens and brings the dish together while maintaining the fatty decadence you’ve come to expect. A clever gimmick backed by confident technique, Grace & Grit offers upscale southern dishes flanked by a kaleidoscope of fancified coarse ground corn. Although maybe not recommended for everyday consumption, if they offered a blindfolded tasting of them all, followed by a two-hour session of a bootcamp-style workout, I’d be there in a heartbeat. Otherwise, plan to pace yourself in the interest of continued coronary health.